The award-winning Daikin brand has spent the last four decades cooling Aussie homes, so one can fairly assume they know what goes into making a good air conditioner! Having won multiple awards for innovation and energy efficiency, their split system air conditioners are a staple in many homes and offices across the Sunshine Coast; let’s break down why! The Zena Series is designed for the modern man or woman living in the modern home. It comes with a sleek and curved cover in either a silver or matte white. Good for open-air rooms, heating or cooling small areas and maintaining the temperature within a room, this may be the perfect unit for you! With Wifi capability, 2-Area Intelligent Eye blades, air purification filters as well as a super quiet running volume, it packs quite the punch! Affordable and easily installable by a professional, what are you waiting for? Daikin has said the US7 is the most energy efficient split system in the country and having looked at both the stats and the accolades it’s hard to argue! It comes with a human presence detector in order to aid that legendary efficiency, and cools a room depending on whether or not it’s been occupied! Good for asthma sufferers or those with a sensitive chest, dry areas as well as introducing fresh air into the home – perhaps this is a better option? Using your smartphone as your remote control, turn on the US7 today! The L series is powerful! Models can reach up to 9.4kw! The L Series also comes with auto fan speeds for a more efficient flow, a 3D air flow which distributes air all across your room as well as the patented Intelligent Eye. It’s a versatile series, making models for all number of rooms, it’s economical, and a good replacement for floor units. While not packed with as many features, if you’re looking for a no frill no fuss solution then you’ve found it! The Cora series is Daikin’s most popular member, and it’s easy to see why. The Cora series delivers ultra quiet cooling operation with bar-setting efficiency levels. The Cora series comes with ultimate precise control, with temperatures able to be set in increments of 0.5°C. As with all other models, Cora series models also feature 2-Area Intelligent Eye. Cora models are so quiet that some models can drop to just 19dBA, which is barely audible to most ears. The wall-mounted Cora series is good for heating or cooling small to large rooms, those looking to keep the ambience, and great for those with one eye constantly on the power bill! 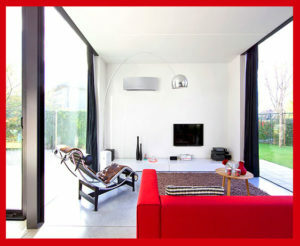 With a massive variety of sizes on offer, there’s bound to be a Cora air conditioner suited for any room. While 2kw models are good for smaller rooms or studies, anything above 8kw would be suited to large rooms or potentially cooling whole apartments! Okay, we know we said four favourites, but this is too good to be left out! Not a split system rather a floor based one, the Floor Standing series comes in a variety of sizes and power! If you’ve got a spare corner in the room then that’s perfect, as a Floor Standing unit boasts a large operating range with multiple vents. The controller comes with a power mode, giving bursts of hot or cold air. On the flip side, the economy mode limits power consumption when you’ve got other appliances running. Ideal for heating or cooling small rooms, there’s little to no installation footprint and is an incredibly versatile option. So there you have it! 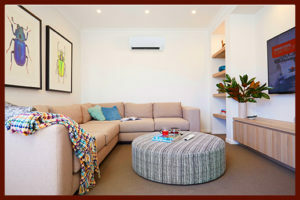 Daikin is an Aussie favourite and when you see their range of products you can see why. If a split system is an option you need then honestly look no further than Daikin. 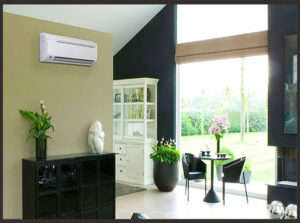 For those looking for duct installations, or something a little more advanced then perhaps Daikin is not for you. 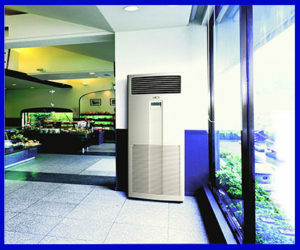 That being said, Daikin is frequently at the cutting edge of energy efficiency and cooling technology.